박성은, 이원찬, 홍석진, 김형철, 김진호,(2011).조석 주기별 오염물질 방출에 따른 마산만의 체류시간 및 해수교환율 변화.한국해양환경·에너지학회지,14(4),249-256. EFDC와 라그랑쥐 입자추적모델을 이용하여 조석주기별로 오염물질의 방출 시점이 다를 경우에 대한 마산만의 체류시간 및 해수교환율의 정량적 차이를 계산하였다. 체류시간은 만 전체에 대해 약 40일이었고 그 범위는 부도 남쪽 해역에서 약 20일 이하, 소모도 상부에 위치하는 마산만 내측에서는 약 100일 이상으로 나타났다. 이러한 체류시간의 공간적 차이는 주로 조석잔차류와 만 내측으로부터의 거리에 영향을 받는 것으로 밝혀졌다. 만 전체 면적에 대한 체류시간의 평균값은 대조기 및 소조기에 각각 약 36일과 42일로 나타났다. 해수교환율은 30%가 되기까지 걸리는 시간이 입자 방류 시점에 따라 최소 약 65일부터 최대 105일까지 약 40일 이상 차이가 나는 것으로 계산되었다. 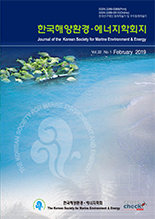 Lagrangian particle transport model coupled with the EFDC have been performed to estimate the residence time and water exchange rate by release time of pollutants over a tidal cycle in Masan Bay. The modelled residence time for the whole bay was about 40 days, ranging from less than 20 days in the southern parts of Budo, to over 100 days in the upper parts of Somodo. The spatial difference of residence time was controlled by tidal residual currents and the distance to the bay channel. The area mean residence time during spring and neap tides was estimated to be about 36 days and 42 days, respectively. The time required for 30% exchange of water was calculated as ranging from 65 to 105 days by release time of pollutants.